Dr. Teresa Yvonne Smith is an emergency physician who has dedicated her training to working in the urban communities of New York City. After undergraduate at Spelman College, she attended NYU School of Medicine. She completed her emergency medicine residency training at NYU/Bellevue Hospital. In 2011, she joined SUNY Downstate/Kings County Hospital in Brooklyn, completing a fellowship in emergency ultrasound, and eventually staying on as Assistant Program Director. Dr. Smith went on to complete her Masters in Medical Education at University of Pennsylvania. Dr. Smith is currently a Clinical Assistant Professor at SUNY Downstate Medical Center and Kings County Hospital. She is the Residency Program Director for the Emergency Medicine Residency Training Program, which heralds as one of the largest EM training programs in the country. Currently, Dr. Smith serves on several GME committees, and has recently accepted the position in the College of Medicine as a Clinical Assistant Dean. Dr. Smith has dedicated her research career to addressing health disparities, particularly focusing on barriers to accessing healthcare for vulnerable patient populations. 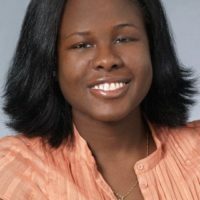 She was awarded the President William’s Health Disparities Grant for her research involving the assessment of the medical and social needs of the sickle cell patient population served by Downstate Medical Center. In addition to focusing her career on underserved patient populations, she has also assisted in several initiatives which have been focused on diversity and inclusion in recruitment into medicine (both in medical school and residency training). She is a proud contributing author to the FEMinEM Blog (Females in Emergency Medicine), and a recent recipient of the Dr. Dale Blackstock Award in Teaching and Excellence at the Annual Women’s Luncheon for SUNY Downstate.